Back for a third year, this event is a true celebration of joy at Lehigh. It was the vision and leadership of Tyrone Russell, Director of Multicultural Affairs at Lehigh University to bring together the various dance groups to celebrate their work in one event. Guests – Born Into the Arts and Rhythm City Dance Crew. Check out this 2011 video of the Rhythm City – and get ready for a great night! 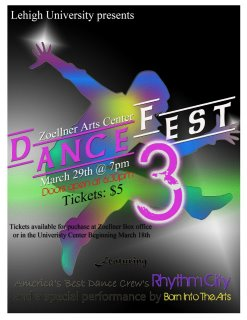 Tickets and T-shirts are available for purchase at the UC 3rd floor (only $5). This event has sold out each year, so don’t miss out this time. This entry was posted in Creative Campus, Student Feature. Bookmark the permalink.